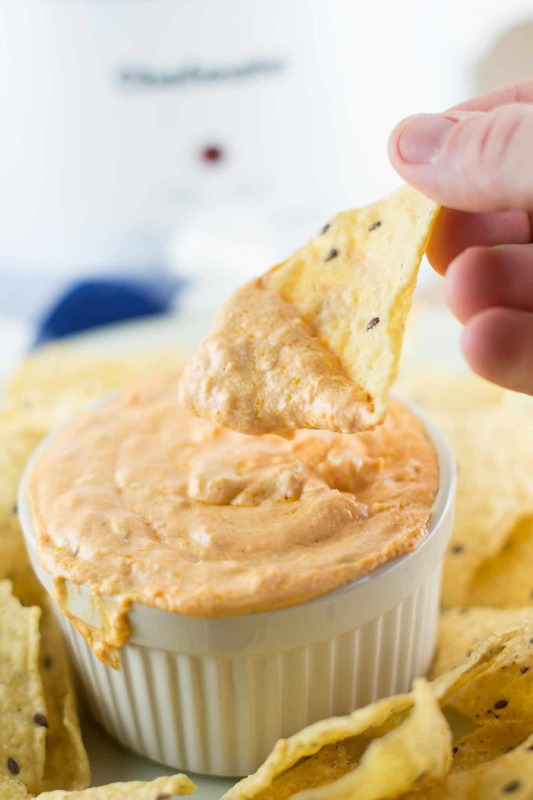 Crockpot creamy queso cheese dip is one of our favorite snacks for a special occasion! We made this dip to enjoy while watching the superbowl. Really any football game is an excuse to make this and devour it! Sunday football has never been more delicious. 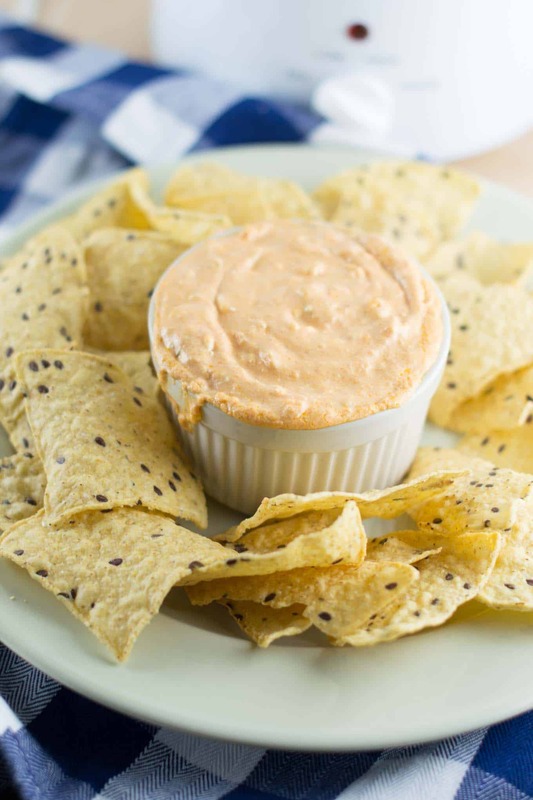 This queso dip is made with simple ingredients and no processed junk. 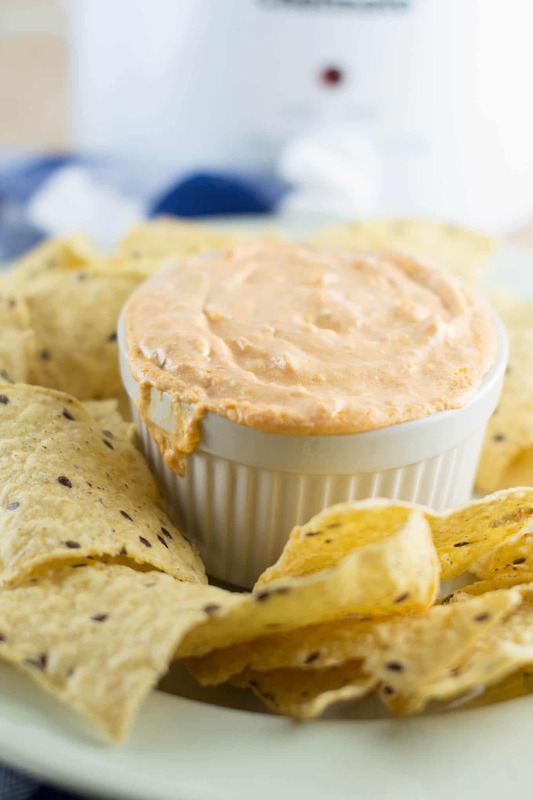 Just plain old delicious cheese dip with mega delicious flavor! So easy to make that you will be whipping it up on repeat. 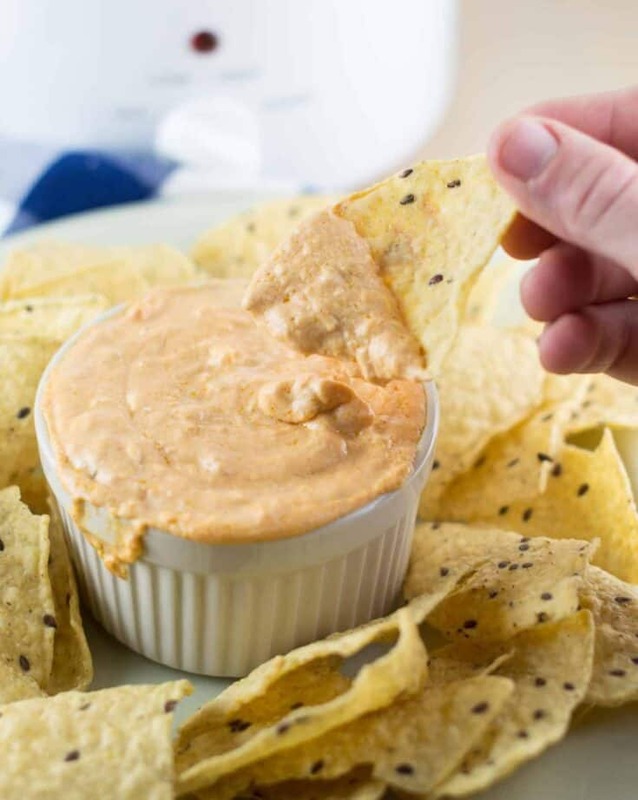 Whether it’s game day, graduation day, or a family get together, this queso dip is sure to be a crowd pleaser. You’ll need the following ingredients to make the queso dip. Add all ingredients to a slow cooker and cook until melted and cheesy. Serve with chips! I’m all about real food recipes that taste amazing, and I’m not about to eat a block of that processed junk anymore. This recipe uses no velveeta, and tastes 100 times better than any queso dip I have had with velveeta in it! You can tell the flavor of real delicious fresh cheese, and it does not disappoint in this crockpot queso! This recipe is just as thick, creamy, and cheesy as it should be, but without the added processed junk! It is made using real ingredients without compromising the flavor. Freshly grating your cheese makes this next level amazing! Jarred jalapenos add a nice little bit of spice without it being overwhelmingly spicy and I love them in this recipe. I’m all about finding little ways to make your favorite foods a little more healthy. 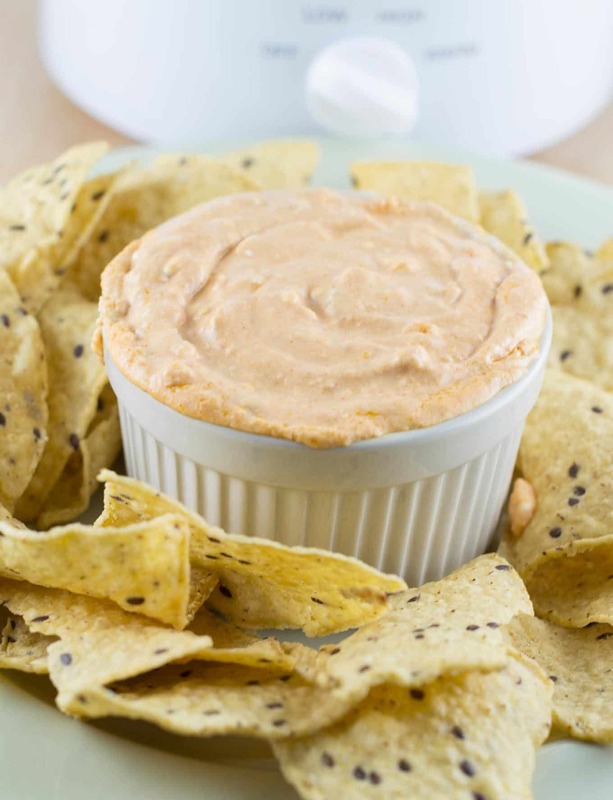 While I wouldn’t consider this dip to be a healthy meal overall, it is made using no processed ingredients which is WAY better than other dips made with velveeta. But honestly, healthy or not, this is one of the best cheese dips out there. You will love how much flavor this has and how simple it is to make! No fuss, tons of flavor, and guaranteed delicious. It doesn’t get any better than that! You need just seven ingredients and a couple hours to make this dip. If you love cheese sauces, be sure to also check out my 5 minute Nacho Cheese Sauce and my easy cheddar cheese sauce! Just dump it in the crockpot and let it all start to melt together! Once the dip is hot and bubbly, serve it up with tortilla chips to dip. This is definitely one of my guilty pleasures. I can’t wait to make this again! Try this for your next football game and leave a comment to let me know what you think! Hungry for more? Here are some reader favorite appetizer recipes! Saving this recipe for later? Click the pin it button below! 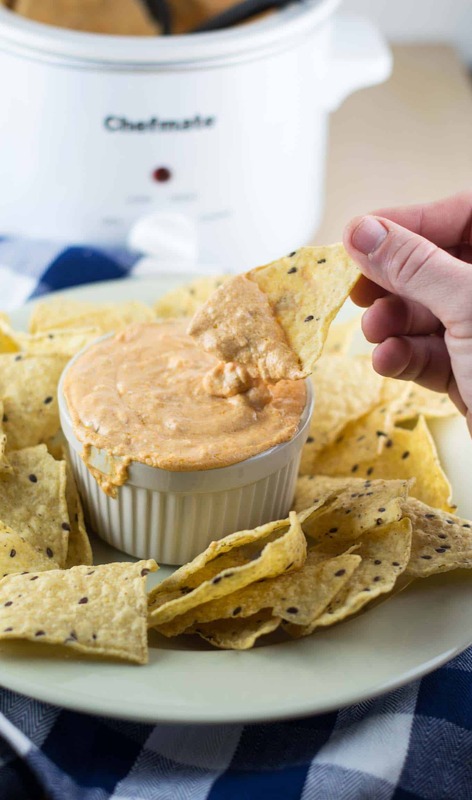 The best easy crockpot queso cheese dip made with no velveeta! Did you make this recipe? Don’t forget to leave a star rating below! Yep I feel the same about velveeta! We made this for the Super Bowl and loved it! could you add ground beef to this to make it a beef queso dip? I don’t eat beef, but I don’t see why it couldn’t be added to this queso. Just cook your beef first before adding it. Do you know how many servings this is? Do you think you can double it with no problems? It’s easily 6 – 8 servings as a side I believe. You could definitely double it, just plan to use a bigger slow cooker! Do you think you could make this on the stovetop? Mi don’t have a crockpot – maybe I should invest? You could make it on the stovetop, but I don’t know how long it would take as it has not been tested this way. I personally love my crockpot and think it’s a great investment!